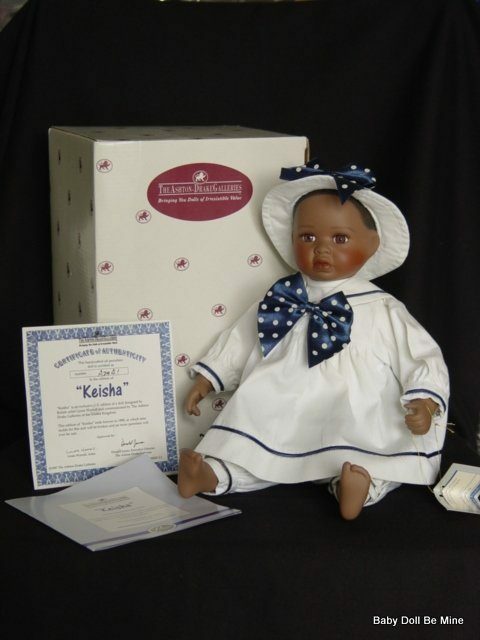 Keisha is a beautiful little African American doll sculpted by the British talented artist Linda Worrall for Ashton Drake in 1997. She is about 10 inches tall in the seated position. Her head, and ¼ length arms and legs are porcelain a cloth body. 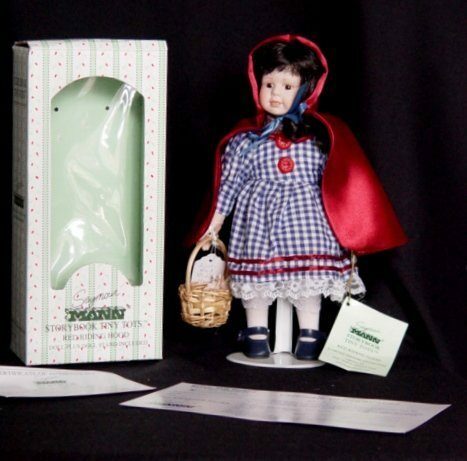 She comes to you in her original box with her wrist tag, COA, and Brochure but is missing her rabbit. She has been displayed but seems to be in good condition. The inside of her brochure reads “Keisha is crafted of the finest bisque porcelain and has been exquisitely sculpted in the best traditions of fine collectibles. She is so well dressed that she could easily be going to Church or visiting a favorite relative. Her white, hand -tailored sailor dress is edged in navy blue piping and adorned with polka-dot bows. The full skirt and matching pantaloons are complemented by a smart hat also trimmed with a bow. 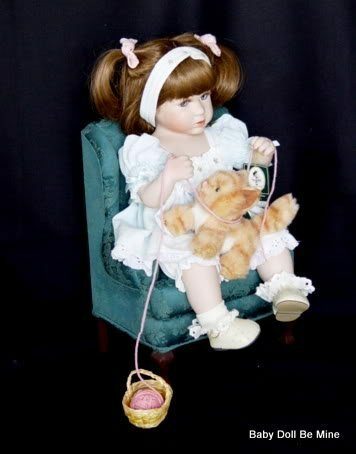 Ms. Worrall, the artist, has designed an outfit which contrasts perfectly both with the doll’s warm skin tone and the bright red bow of her fuzzy friend, Mr. Rabbit. ( Mr. Rabbit is missing). 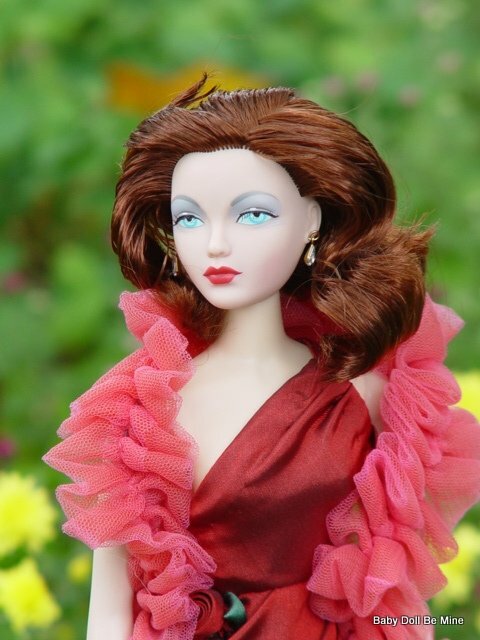 Keisha was first produced in an edition for the European doll market, under the name Camera Shy Chloe. 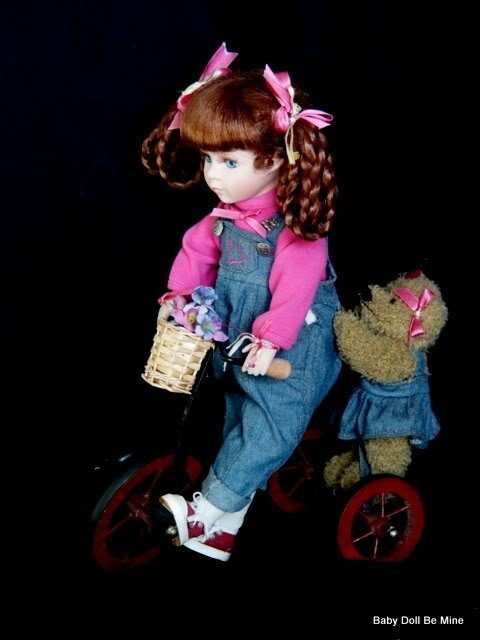 It was the first ever black doll to be exclusively commissioned by the Galleries in the UK Renamed Keisha to avoid confusion with another Ashton Drake doll in the us with the name Chloe, this edition is offered exclusively to clients of the Ashton Drake Galleries”.